The brain is the most complex organ in the body. Every expression of what it means to be human is contained within it. Yet like every other part of us, the brain has diseases that are specific to it. One set of these are the disorders we call mental illness. Only by furthering our understanding of the brain can we hope to cure them. Knitting and quilting are for me a medium of expression, as well as a form of therapy and a creative outlet. As I begin to prepare for my 6th Out of the Darkness Overnight Walk, I wanted Hope Tree II to convey the message that mental illness is a disease of the brain, and what better way than to create a colorful interpretation of this mysterious organ. 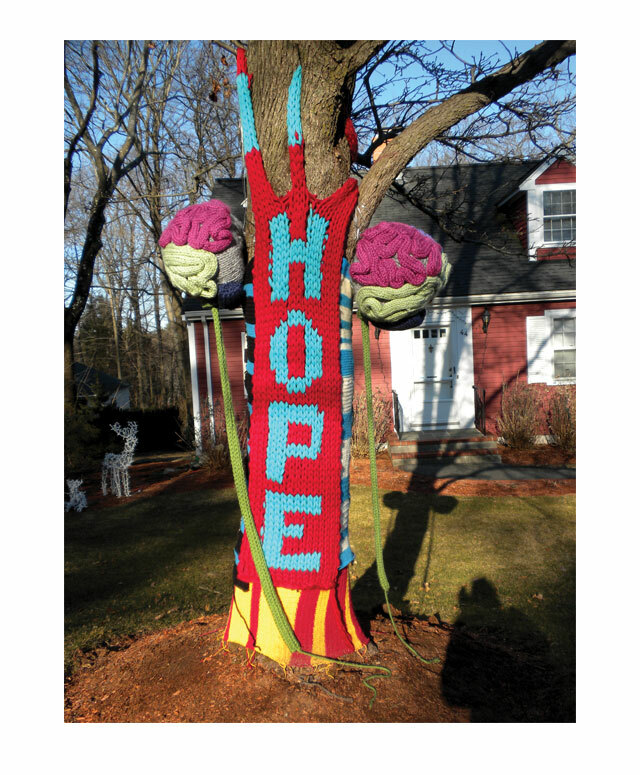 The brain that hugs the Hope Tree is a free form creation, clearly not a scale model, but hopefully one that will elicit responses both playful and serious…bringing smiles as well as reminders of a serious illness and its tragic consequences. The brain consists of the cerebrum which sits atop the cerebellum and the brainstem. The cerebrum is divided into two hemispheres, each containing four lobes, the frontal, parietal, temporal and occipital lobes. The frontal lobes (dark pink) are responsible for problem solving and judgment. The parietal lobes (purple) manage physical sensation, handwriting and body position. The temporal lobes (light green) deal with memory and hearing. The occipital lobes (orange) contain the brain’s visual processing system. The cerebellum (navy) and the brainstem (dark green) control your muscles and the basic functions of your body like breathing, sleeping, coordination and balance. The cortex is the outer layer of the brain, our so-called grey matter. It’s made of nerve cell bodies folded into bulges (gyri) and grooves (sulci), the wrinkles you see in typical representations of the brain. 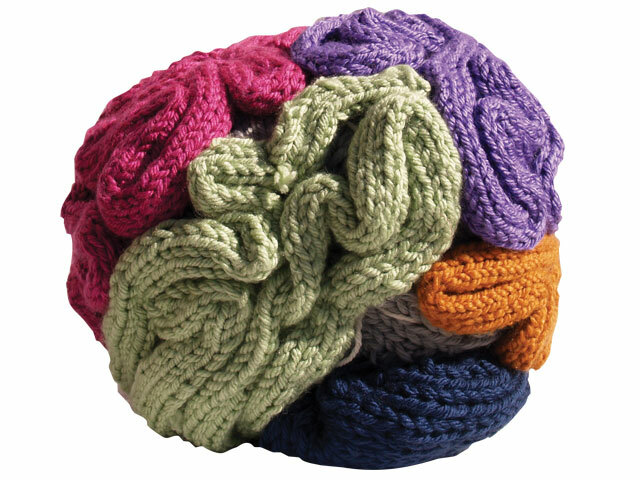 The cortex of the Hope Tree brain is represented by “squiggles” formed by a knitted cord. The brain contains an average of 100 billion nerve cells, called neurons. Neurons secrete chemicals called neurotransmitters that transmit electrochemical signals across the gap (the synapse) between neurons and from neurons to other cells. The inner layer of the brain is white due to the protective myelin sheaths that cover millions of axons – the long, thread-like tails of neurons that transmit the brain’s signals. Representation of neurons adorn the tree complete with cell body, dendrites and axon. The Hope Tree brain is by no means made to scale. Consider for example, Albert Einstein’s brain was the size of a small cauliflower, weighing 2.7 pounds. The Hope Tree brain is the size of a large watermelon and weighs 9 pounds. For information and pictures of the original Hope Tree, click here. For more information on the Brain and to “play” with a 3D brain go to www.finr.net. RoseMary also thanks all the knitters who have contributed to Hope Tree II, including Valerie Olpp, Georgette Katuna, Noreen Green, Janine Kurth, Maritza Ebling, Zoe Jacobson and Sarah Schrier.